Explainer: How Did Inequality in America Get So Bad? And What Can the Government Do to Fix It? It took thirty years for inequality to become this dramatic, and it will be a generational project to reverse it. In one of the more odd recent pairings, both the wonks at the Congressional Budget Office and the activists occupying Wall Street and beyond have come to the same conclusion: inequality is skyrocketing and one percent of the country is taking home a bigger and bigger share of all the income in the country. The CBO just released a study, years in the making, which confirms that the income for the top one percent has nearly tripled from 1979 to 2007. And not only are those in the top one percent much richer, they also take home a larger share of the economy as a whole than they did thirty years ago. What caused this? And what, if anything, can the government do about it? Below, Mike Konczal explains. 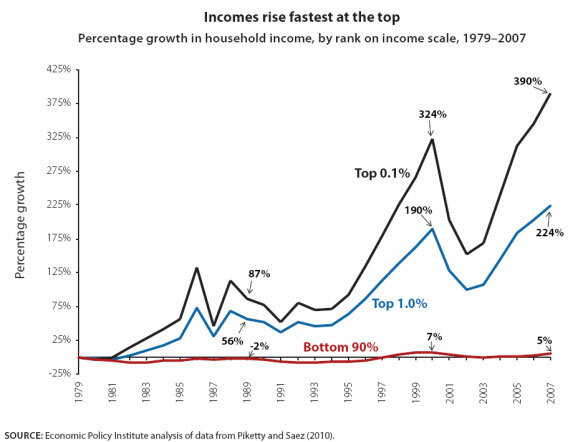 How did inequality skyrocket so dramatically during this time period? The first place to look is how those in that top one percent are making their money. And when we do, we see that a large majority of one-percenters works in the financial industry or are high-level corporate executives, including CEOs of large multinational corporations. Thirty years ago, a CEO would make around forty times as much as one of his workers. Now it is over 300 times as much. There’s a debate over whether or not CEO pay has gotten so high because corporations have gotten so big, or because CEOs have a lot of control over the boards that appoint them to office. But whatever the immediate cause, Wall Street pay soared as deregulation of the financial sector—the kind that brought on the financial crisis—continued. So CEOs get paid a lot while workers earn too little. Is this inequality the inevitable outcome of a competitive marketplace? Remember: the government writes the rules for how markets work. Markets aren’t “natural.” Property rights, regulations and other rules of the marketplace are derived from the law, and they can be written and rewritten to either promote or fight inequality. Over the past thirty years, the government had been changing the rules in ways that have grown inequality. The dismantling of the fragile New Deal–era financial regulations over this time period tracked an explosion in salaries for those who work in the financial sector. Inequality at the top end, particularly at the top 0.1 percent, is largely a function of those highly paid employees. If the financial sector produced mass prosperity, those salaries might be worth it. But now that we’ve survived bubbles, knowingly created bad financial instruments and bailouts for “too big to fail“ firms, it’s clear that financial services industry is not a generator of wealth for the average taxpayer. Meanwhile, the rules that determine what constitutes property itself have been turned into a mechanism for inequality. As Dean Baker recently wrote in his book Loser Liberalism, patent laws allow incumbents and shareholders to reap windfalls. The Organization for Economic Cooperation and Development, for instance, found that the number of patents per capita was the most important factor for determining redistribution of wealth towards the top. So, I’m with you on the dramatic increase in wealth for the richest. Have the rules of the marketplace been changed to depress wages for the rest? In a word, yes. Median wages have essentially shown no growth over the past thirty years when you control for inflation. This wage stagnation, for men, looks to be a function of decreased unionization. Unionization rates were above 25 percent in the late 1970s. Now they are under 12 percent. For women, the decline in the real value of the minimum wage over time has increased inequality at the low end of the income scale, and since women earn less than men on average, this drop in the minimum wage particularly increases inequality within the female workforce. Inequality for women has also gone up as a result of the minimum wage not being increased and losing a lot of its value throughout the 1980s. The United States government also has pursued a strong dollar policy, making it harder for manufacturers to export their products to other countries. And international trade has been structured to put manufacturing in direct competition with other countries. So that’s the marketplace itself. How about taxes? Have taxes changed over the past thirty years? When April 15 rolls around, you may fill out TurboTax, wait for your refund, and try to stop thinking about taxes as soon as possible. But it’s worth giving more than a moment’s thought to how taxes are structured. Taxes are often referred to as “progressive” or “regressive.” Progressive taxation means that the tax rate increases as income increases. This is justified because people with more income have a greater ability to pay, and they have benefited the most from the economy. Different types of income are also taxed at different rates; the payroll taxes you pay on income that you get from a job are a different rate than taxes on income from investments, for example. Progressive taxes reduce inequality, because those at the highest end pay more and those at the lowest end pay less. Thanks to a series of tax cuts, including the Bush tax cuts of 2000, our tax code has become less progressive in the past thirty years. Increasing the progressivity of the tax code would help immensely. Going back to Clinton-era tax rates would be a start, as would increases in the number of tax brackets, so that wealthier taxpayers could fairly pay a higher rate. Lifting the “payroll tax cap,” that is, how much income you make is eligible for to be taxed for Social Security, would help. Does how the government spends taxpayer money impact inequality? Yes, very much so. Paul Krugman has defined the federal government as a “a giant insurance company, mainly serving older people, that also has an army.” The way this insurance company spends its money can be more and less beneficial to the poor. Cornerstone government programs like Social Security became less progressive over this period because benefits accrue more to the middle-class than the poor. Programs like unemployment insurance and the Earned Income Tax Credit are the ones that keep the working-class from sliding into poverty and promote class mobility. Much of our redistribution is tied to employment. One of the biggest benefits that has gone to the working poor over the past thirty years is the earned income tax credit (EITC), which is a benefit to low-income workers—but this credit is not available to the unemployed. One simple way to increase the wealth of those at the bottom is to provide a guaranteed minimum income, or expand and increase the EITC. One way to make the social safety net stronger is for the government to provide goods more directly. As more and more of government services are provided using the tax code and subsidies, a series of benefits that Suzanne Mettler called “the submerged state,” the system becomes more unequal. Tax code benefits go to the rich because they reduce progressive taxation and often require hiring sophisticated tax experts to take full advantage of them. It took thirty years for inequality to become this big, and it will be a generational project to reverse it. The most encouraging advancements are in the fights among the business communities. Patent abuse, for instance, has become something that businesses are becoming more aware of as a major problem. Retailers have successfully brought regulation to regressive, uncompetitive debit-card fees that transfer income upwards. The big issues, however, will be in both the tax code, which will need to go up in the future, and the labor force, which will need a higher minimum wage, better unionization rules and wage subsidies. Those will be the battlefields that determine whether or not the wealth we produce in the twenty-first century will primarily go to those who already have the very most.